Find out how to set up the Hazard App on your smartphone, to get the alerts you want. Set-up instructions are provided for Android and iPhone users. What is the Hazard App? The Hazard App will help people respond to everything from road closures and weather events to tsunami, earthquakes and pandemic. The app provides life-saving information during and after emergency situations. Who will I receive alerts from? Regional organisations, including Civil Defence Emergency Management Groups, choose whether to send alerts. Currently, Civil Defence is rolling out use of the app in New Zealand and not all regions use it. Find out which agencies are participating. 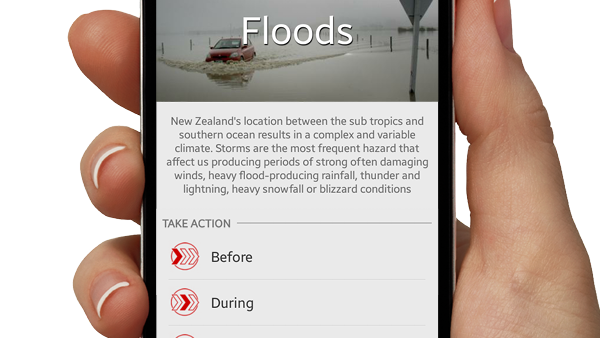 Please note while the app has our name on it, alerts do not come from New Zealand Red Cross. The alerting agency sends a notification to the app, for a particular region and hazard type. If you are monitoring that location (e.g Wellington) and hazard type (eg. Heavy rain warnings), you’ll receive an alert. You’ll only get alerts for the locations you are monitoring. Alerts are sent as push notifications. I didn’t receive an alert. Why? At this stage the app is still being rolled out around the country and is not being used in all areas, check here to see if your local Civil Defence is using the app. Alerts go to the areas that are going to be potentially affected, and if you are monitoring them, e.g. if you are in Auckland and just monitoring Auckland, won’t get an earthquake alert for Hawke’s Bay. Refer to the FAQs below to help you set up a new location. Please note push notifications are not retrospective, however, all active alerts appear in the app. Sometimes you’ll need to modify the settings on your phone. Keep reading below. Tsunami alerts are alerts that come from your local Civil Defence authority who have launched with the app. We are continually working with our CDEM and other partners to see how we can support these alerts nationally in the future. Why am I getting so many alerts? If you’re receiving a lot of alerts, you may be monitoring a large radius around a location. If the radius of one of your monitored locations crosses into another area you are monitoring, you will receive an alert for both areas. You can help reduce the number of these alerts by reducing the size/radius of the locations you are monitoring, for example, to 5-10 kilometres wide. When you download the app, you are signed up for ALL alerts. You may want to reduce these – refer to ‘How do I select which alerts I receive’ below. You may also be getting more weather alerts than you’d like refer to ‘How do I get fewer weather alerts’ below. How do I select which alerts I receive? The severity of each hazard. If you would rather not receive a type of alert for one of the areas you are monitoring, simply go to your monitored location, select that location and swipe ‘Off’ for the alert(s) you no longer wish to receive. How do I get fewer weather alerts? Four different types of weather notifications are available: Watches and Warnings for Severe Thunderstorms, and Watches and Warnings for ‘broad-scale’ severe weather (typically for rain, wind and snow). Watches are a “heads-up” that severe weather is possible and that Warnings may follow. They are also used to advise of weather conditions which are not sufficiently severe to justify a formal warning. Another way to reduce the number of alerts is to reduce the size/radius of the locations you are monitoring. Can I receive alerts if I’m not in New Zealand? You can only receive alerts from the app, if the billing address in your app store is a New Zealand address, and you are using a New Zealand credit card to pay for apps. This is due to our licensing agreements and because Red Cross has over 20 Hazard Apps – we need to make sure that users are downloading the correct one. We are part of a Global App project which is looking at moving towards global alerting zones. This means users who’ve downloaded an app from their country, will be able to pick up New Zealand alerts when they come to New Zealand. Some of the alerts will be global, so will be picked up everywhere. Which operating systems support the hazard app? Android OS - 4.0.3 or later. The app is not currently supported by Windows. Will the app automatically update on my phone? As new versions of the app are released, updates will automatically come through if your phone allows this. Otherwise, make sure you keep the Hazard App up to date. We are continuing to work and enhance the Hazard App to make it more effective. Ensure your device's Location Services/GPS is turned on. This can be found in your device's 'Settings' menu. When installing the app, enter your primary location first. Then set up other locations to monitor. Activating the ‘Monitor current location’ function will monitor your location as you move around, based on GPS location. This is best used when travelling or visiting other parts of New Zealand. Note: Leaving ‘Monitor current location’ on does use more of your device’s battery. Below are step-by-step tips for Android and Apple devices. How do I set up a new location to monitor? How do I edit an alert radius? How do I choose which alerts I wish to receive? Note: It is strongly recommended that ‘General Notifications’ remains turned on so you receive Civil Defence alerts. How do I monitor the alerts in my current location, so the app knows where I am at all times? Note: For this feature, your phone’s location settings must always be turned on. This may increase your battery usage. How do I monitor my current location so the app knows where I am at all times? Why does the app ask for permissions to the various system functions of my phone? The permission list is something that is determined by the iTunes/Play store. We aim to have the least number of permissions that these stores will accept, however their decision is determined on what the app needs to function. If not, please get in touch with us at hazardapp@redcross.org.nz and we can help troubleshoot.